EMC is changing the way to eat storage through ScaleIO as It has been exposed in my last note. There are also companies like Nutanix that has been shaken the market with this new trend of Full Cloud Converged Stack for a while. 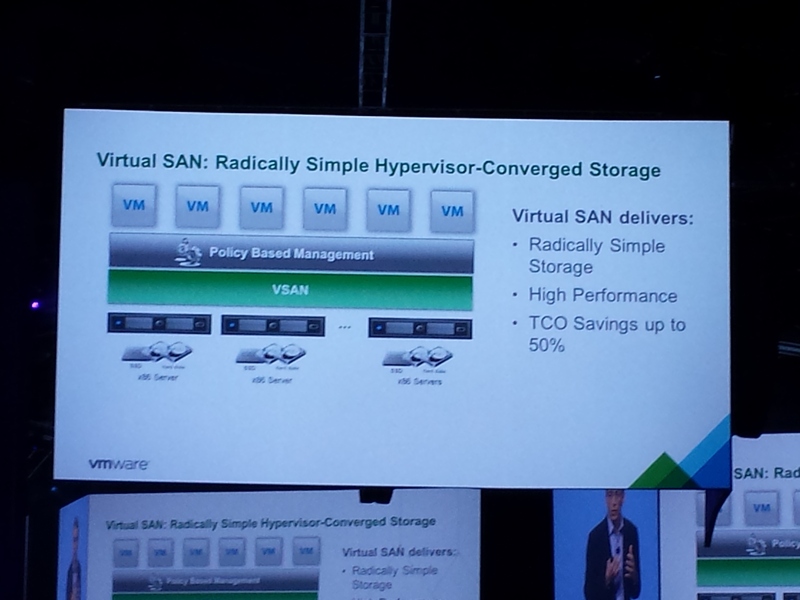 However, VMWare has started to show out its Virtual SAN since the last VMWorld as its response to this so mentioned Software Define Storage (SDS) reality. 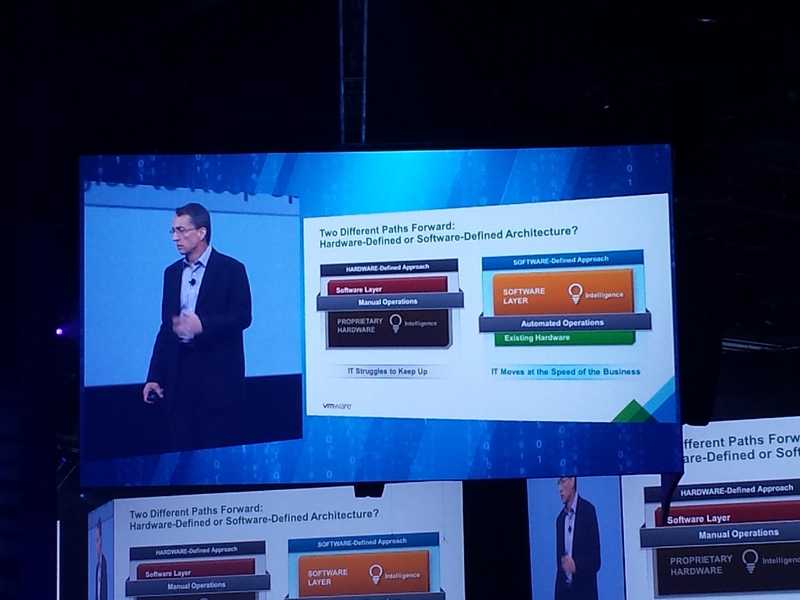 Pat Gelsinger showed las week at #EMCWorld the following very well: SDS “moves at the speed of the business” and VMWare has so much to tell about it with its Virtual SAN Strategy. VMWare Sphere 5.5 and Virtual SAN helps you to get a totally converged cloud experience thanks to its flexibility and automation. Despite there are other options as I previously stated such ScaleIO and Nutanix, the simplification and the insight that VMWare can offer to manage every compute, network, and now storage component from the the same console is unbreakable. Virtual SAN helps you to get better storage access availability level and a nice disk performance through the entire VMWare Cluster (limited up to 32 nodes) and manage every local disk device in every host server as a consolidated scale-out ecosystem. It gives you a VM-centric-policy-based management to bring more performance to the most disk-intensive, and usually most critical, applications. In other words, to get a more cost effective operation through a Simple HyperVisor-Converged Storage. Virtual SAN provides a read and write cache in every disk group through one flash card/disk device – you can have up to 5 disk groups per host server and seven disks per disk group according to Virtual SAN™ Design and Sizing Guide – transparently to any VM configured into the ESX Cluster. Cache helps you to get cheap high density disks not sacrificing so much performance. Also, you can set different level of redundancy to avoid any crush against any disk device or host server failure – you can get up to four copies of the data evenly speared through the entire ESX cluster- This feature allow you to remove or to add more disk devices or host servers without impacting to the disk accessibility. Virtual SAN enables Disk QoS settings for every VM and allow you to combine Q0S at VLAN level to help you to sustain performance level during contention scenarios. Same as ScaleIO, Virtual SAN allows you to use commodity hardware and lowers the cost of the hardware infrastructure dramatically in comparison with traditional converged stacks. If you are confused about the differences between ScaleIO and Virtual SAN I suggest you read this note: EMC explains differences between ScaleIO, VSAN and ViPR software. Basically the differences are related to scalability and flexibility of ScaleIO to work with others solutions besides VMWare. Also, I suggest you to read this note about Nutanix compared with the beta version of Virtual SAN: Nutanix Virtual Computing Platform compared to VMware VSAN 1.0. I think there are many of these compared features that can be applied today. IMHO the only one strategic issue that VMWare has, It has really VMWare-Hyper-Visor-Centric with all its developments. Doing that, VMWare has the warranty to shorten all product development’s timeframes, but also limit of the usability of its product in other solutions like OpenStack and Hyper-V.